I had written this trip report up just for my own "diary" purposes, but a friend asked me to post it here. My writeup is from the perspective of someone inexperienced in Europe making first flights abroad, so it might help someone in the same position. - I Went to France once in my microlight, 2 years ago, with 2 other pilots - pretty easy, i just followed their lead. - Finally with all ducks in a row, I just had to go abroad and picked a dead-easy bread and butter Le Touqet run. As my first trip alone i'm on a steep learning curve, but have researched it to death and authored (with this forums help) Deanland website's flying abroad cheat sheet. - Saturday's le touquet trip was only 32 minutes and all went swimmingly to plan - so we decided to do another one on sunday and picked Midden-Zeeland to make it a bit more challenging. Firstly i referred to the flying abroad page on the deanland website, which i'm writing and updating as i gain more experience. It's already had input from several seasoned pilots. 2. Filed a flight plan using sky demon for the PC, adding in EGMDZTX as a custom address - this will send the FPL to Lydd. Note you can't do this on the iPad so you have to use the PC version for now. Coming soon apparently. 3. Filed an online GAR for both departure and return. Note that departure is OPTIONAL but return mandatory. I'm being nice and filing both, its no extra hassle, keep them sweet. -Everything else on the deanland website, very especially weather! Noted a NOTAM of a flying display just north of my track. Printed out the Le Touquet Plate. - Took off from Deanland exactly on time. I believe within 30 minutes of your FPL time is acceptable. - Flew to Lydd, gained a basic service from 20 miles away from them. Immediately requested they opened my flight plan. I had to ask them to confirm they had done so. - Just off the coast i climbed up above the clouds through a hole, and it was perfect sunshine up above. As i went further, the holes in the clouds become crystal clear and i could see the water very clearly. During this phase of the flight my A.H. was essential, i would have probably got very disoriented without it. Total blue-out occurred, and there was no horizon, and very little to orient myself with. When this happened, i just stare at the A.H. and feel comfortable. Up to this point have been at 120kts in rough air, and now increase to 130kts, full throttle at altitude which equates to only around 55% power due to the thinner air. - Once inside the CTA, he cleared me for a downwind join to runway 32. I descended from 5000ft, directly aiming at the left of the runway, and joined downwind at 1000ft perfectly having descended at 700fpm. Two right turns and final for 32. - Once landed, park up on the apron, and head to the yellow 'C'. Walk past abandoned customs desks, straight to a reception and pay 28 euros. Order a taxi to the beach! - After starting up and the usual radio babble, i was told they had no flight plan for me. I said I had filed it at 8pm the day before, and he said he'd call me back as it may have gone to Paris. 2 minutes later, all is good and i'm cleared to taxi. - Once in the air, i climb at 70kts on full power all the way to 4000ft, watching the sky demon glide safe to make sure i can make it back if the engine goes titsup. Once at 4000ft, increased cruise to 130kts until I see lydd (and a layer of cloud overhead) and i descend at 140kts to slot in under the cloud. - After perfect smooth flying, once under the clouds its bumpy, and i return to Deanland at 120kts. Note that customs didn't greet us at either airfield. 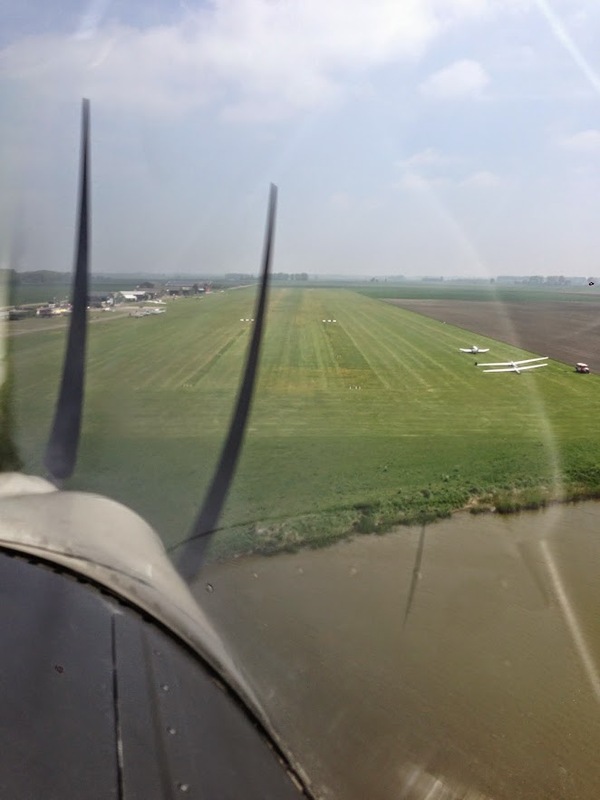 Trip to the Netherlands - Midden-Zeeland airfield. - Planning was all the same as before. I've refined the Deanland flying abroad page even more now, and will continue to add my experiences to it. Only difference is that i got a reply from the airfield asking for a few extra bits of info, and saying they would call customs. - Take off in the morning was into 'murk' but very clear it was better than yesterday. Clouds were very high, it was just terrible vis down below. I climbed steadily towards 5000ft which i achieved before i reached Lydd. At 5000ft we were well clear of any haze and could see clearly all the way to the horizon, and looking down had a clear view of boats on the sea. I noted how incredibly calm and still it was, the aircraft was flying hands off, without even a tiny bump - absolutely perfect cruising weather. - Lydd had activated my flight plan from 20 miles west, as before, and then handed me over to Lille approach 10 miles out. They ask what time I set off, in order to accurately note the plan, and i replied "one five" meaning a quarter past, without specifying the hour. Note that I go to Lille before actually using their airspace - whilst this particular bit of airspace is open FIR, it could easily have been controlled airspace, so it's a good habit to get into - ask before entering. I had a hell of a time understanding the guy on the radio and even dialled in a wrong squawk. he was paying attention to his radar and quickly pointed this out! - Lille gave me a squawk of 6100 which i then kept all the way through belgium. Nothing much happened, i just spent a few minutes checking every single thing i could think of twice over, and spent around 5 minutes in 'dead zone' where an engine failure sees us plop in the ocean. Sky demon glide safe helps here, and in a panic would lead to a very fast and correct decision which way to turn. At this point i'd picked up a 26kt head wind, so it was slow progress. Indicated airspeed was 122kts, true airspeed 133kts, ground speed 107kts. - I called up Oostende, heard a much clearer accent, and then proceeded to transit the 32 miles of belgium coastline without seeing another soul or hearing much on the radio either. I heard one guy routing direct from Headcorn to Oostende. That's a longer water crossing than i was doing. -As I neared Dutch airspace, i requested change to "Dutch MIL" and was told frequency change approved. My RT was something along the lines of "Dutch MIL, G-TESR"…….."G-TESR is a tecnam from UK Echo-Golf-Kilo-Lima to Midden-Zeeland,8 miles inside Belgium airspace, request Flight Information Service. Have 1008 and squawking 6100". He told me to squawk 7000 and i never heard a peep from him until i changed to the local radio for the airfield. - I had to plan my descent carefully. i didn't want to go down to quickly due to my ears not liking it, and decided on 500ft/minute, meaning 10 minutes, meaning 20 miles. So i started descending at 20 miles. Lucky I did because as i approached the coast of Holland (well, the north of the river mouth) there was cloud and haze, and as i slotted into it at 1700ft, it was bumpy, just like UK had been. - As i started my descent, i noted that this was probably the longest I had ever had full throttle applied on the engine - literally since takeoff, without a single reduction. This might sound like i'm a hapless vandal trying to wreck my engine, but actually this isn't the case with a VP prop and altitude. Firstly, for the climb, full power on cruise mode sees the engine at 5000rpm, which is immediately around 75% power at around 1000-2000ft. As you get to 3000ft it reduces until finally at 5000ft it is producing 52% power at wide-open-throttle. This is confirmed by a very low MAP (Manifold pressure) reading. At 5000ft, wide open throttle sees only 122kts, whereas wide throttle at 2000ft would see you hitting 140+ on a high pressure day. From all my research, i believe the only thing wrong with using full throttle all day long is this nagging thought that you're doing something wrong! - What a beautiful approach, over the river, and some islands, i joined the circuit making clear circuit calls, and the tower acknowledging each one. I turned final, and half way down, somebody decided to cut straight in front of me. I graciously went around and tried again! - On landing, i filled up with some "Euro 98 MOGAS (ethanol free)" and parked. Didn't need the fuel, but i've never bought mogas from a dutch airfield before, so why not. 2 customs officers came over and spent 10 minutes examining our passports and phoning the information to HQ. This wasn't inconvenient as i was fuelling at the time. They noted that someone had cut inside me on final! After all this excitement, I taxied off to parking with the grounding strap still attached (and didn't notice). I assume it popped off and somebody put it back because no harm was done. I will take MUCH more care in future. - Up to the tower, and paid my 88 euros for 30 litres of mogas and a landing. 25 euro landing and 2.12 per litre. She apologised for the fact someone cut me up and told me about the grounding strap! She was actually apologising for me… saying i was probably flustered after the go-around and customs. - Takeoff was 'fruity'. An 18kt dead-across crosswind saw some interesting technique. I held aileron into wind, and rudder into wind was required also as we accelerated. It was a grass strip so i tried to lighten the load on the nose wheel without pulling it up off the grass. I then positively rotated at 40kts and we jumped into the air and immediately kicked into a crab of plenty of degrees. It was them bumpy as hell for the next 3 minutes, all the way to the coastline after which it calmed down. - Excited about picking up the 24kt tail wind i had on the way in, especially as there was such a cross wind, i was badly disappointed to find my Dynon telling me wind is "LT" (meaning light, barely detectable). And this was the same the whole way home! Nonetheless, the 1:28 journey time on the way was reduced to 1:12 on the way back. - Flying home was a repeat of the way here, except my RT sounded more polished. On the way back i thought i'd talk to Manston instead of Lydd for a change, but they said i was just outside of their radar coverage, so i should just talk to Lydd. Reason i wanted mansion was for the radar, as Lydd don't have one. - As lydd came into view, i saw thick cloud at my level, 5000ft. I radioed and asked them their cloud base, and another pilot chipped in and told me there was cloud at 4200. I stuck 4000 into the autopilot and descended gradually down, making sure i was still within glide of the field. Once into UK, we were welcomed home by horrible turbulence all the way from Lydd to Deanland. My passenger was not a happy bunny. Roy went up in the Turb later and said he hadn't seen weather this bumpy in ages, and it was very strange given that the wind was only 5kts! The picture attached is the comedy of my post-it note jotting system. 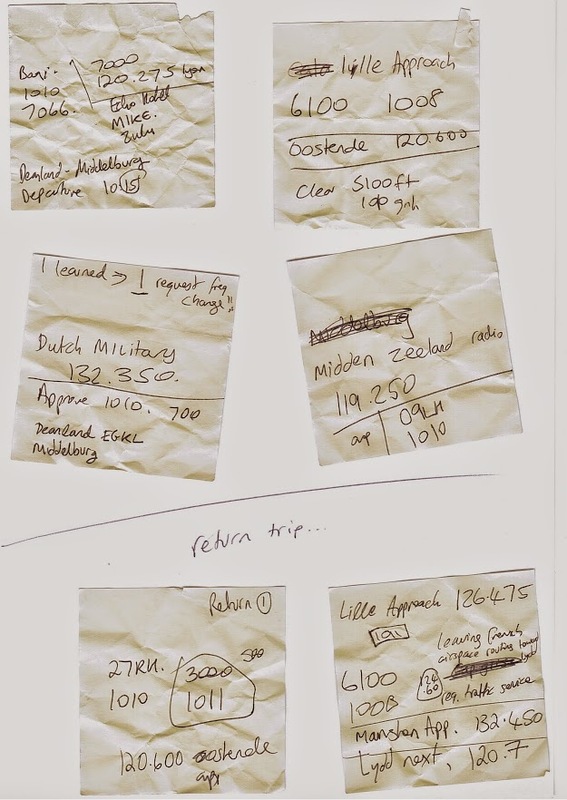 To be organised on trips like this you need to have a jotting pad that's very readily available, and need to discard information. I used 4 on the way there, and 2 on the way back - a reflection of growing confidence in what i was doing. I'm sure my cryptic notes make no sense to anyone else at all! Note that I wrote "Dutch Military" incorrectly - MIL does not stand for military, so they should be addressed as "Dutch MIL". Last edited by carlmeek on Wed Jun 19, 2013 1:54 pm, edited 3 times in total. RV-10, Ikarus C42 and a Gazelle AH.1. carlmeek wrote: -As I neared Dutch airspace, i requested change to "Dutch Military"
Very nice write up, Carl. You have done the hard bit now as It really doesn't get any more difficult the further into Europe you go. 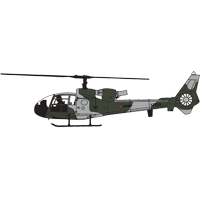 As a matter of interest, the call sign is "Dutch Mil Info" and I believe the "Mil" stands for Milligen rather than Military. Jodelman wrote: ... as It really doesn't get any more difficult the further into Europe you go. That's good news, as I now plan to go south & east a lot. Living in Brighton, and having travelled to all corners of England/Wales already, its bizarre to realise how close "foreign" is! Jodelman wrote: As a matter of interest, the call sign is "Dutch Mil Info" and I believe the "Mil" stands for Milligen rather than Military. Assumptions are killers, eh? I saw Mil and assumed military. I'm pretty sure i said "Dutch Military, G-TESR" and nobody laughed at me. Perhaps i'm not the only one! I'll edit the report above so nobody reads it incorrectly. That's good news, as I now plan to go south & east a lot. I'd strongly agree with Jodelman; in fact, I'd say it gets easier once you've passed the chore of entering Schengen via the first Customs field. You might not believe thta, the first time you look at all the red on teh French chart denoting Danger Areas, but the relevant Info Services are excellent at clearing you through them when able, and many of them are avoidable vertically (cloudbase permitting) anyway. At the weekend, most disappear. Nice write-up; as I suspected on the other thread, we were indeed at Le Touquet at the same time. I heard you arrive, I now realise, and we left (after our brief jaunt to St Omer) just before you, as I recall hearing the RT exchange about your flight plan faff. After twice now finding out after the event that G-reg aircraft on the ramp were forumites, I really should wander about wearing my snazzy lanyard more often! All good stuff... can't wait to explore more. I was interested in the RA/DA zones splattered down the west coast by, and south of, La Rochelle. If you wanted to route to Bilbao, would it be safe to plan to go over on the assumption that FIS will clear you through? carlmeek wrote: I was interested in the RA/DA zones splattered down the west coast by, and south of, La Rochelle. If you wanted to route to Bilbao, would it be safe to plan to go over on the assumption that FIS will clear you through? Have a look at the French AIP online (in fact, there's a handier online reference but I don't have the link immediately available) for activity times etc. The French VFR pack, available by post or (e.g.) behind the counter at Le Touquet or Luc & Edith's shop at Cherbourg is helpful but not essential if you have Internet comms. Most Danger Areas seem OK for a cleared crossing so long as they are not actively "hot" at the time, so you'll need to plan alternatives. The ranges S of Bordeaux around Cazaux AB on the coast often seem particularly busy, but routing inland usually works, I think. Thanks for taking the time to post your trips. I am planning my first foreign jaunt in July so it's all nuggets of gold to me. Just found this thread and it's very useful as I was intending to do the Germany Fly-Out (now unlikely due to weather and my availability). The Deanland website page on this is extremely useful. I was putting some of my own checklist stuff together but the Deanland one covers that and more. It will be printed off for later use! "Temporary permission is required to fly in airspace 10 days in advance which costs 94 Euros for the year." I believe this only applies to Permit types. Gave me a bit of a heart stopping moment because this was the one thing on the checklist I hadn't come across elsewhere! Edit - but I presume the 172 doesn't yet fall into that category! I've made the edit - sorry about the heart stop! I'm glad you find the page useful, for me I print it out for each trip. Thanks for the feedback, i'm always looking for small improvements, often I scribble something on the print out and update it onto the website later. Because it's my first couple of trips, I'm noticing things that more experienced guys would just take for granted, so it's an ideal opportunity to feed back all things learned.